I’ve finally finished my coat, and I’m so happy to share it with you! But I have to tell you, posing for photos like this is my least favorite part. Do you feel that way too? Where can we find you on the internet? Right here, mostly. But also here, here, and here. Fabric: Furry wool, acetate lining, Thinsulate interlining. Sizing: I chose the size based on my hip measurement, since that’s where I’m widest and that’s where the coat is narrowest. Did the fabric work well? I knew this was going to be a challenge, but that’s what sewing is all about, right? I wanted to make a really warm winter coat with a full Thinsulate lining since it’s so difficult to find anything that’s legitimately ready for frigid weather, and I’m always cold. 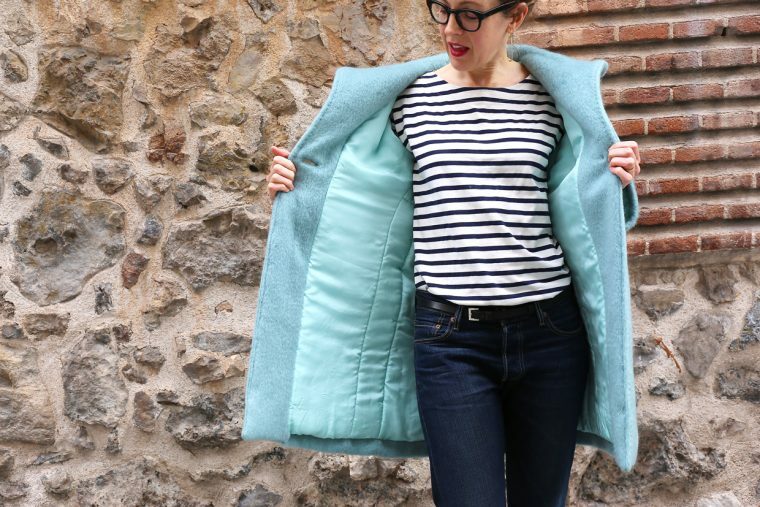 I fell in love with the furry turquoise wool on a trip to Paris, so I knew this would be a dramatic coat between the color and the thickness of the fabric combined with the Thinsulate. How did the sewing go? Great, but there were plenty of challenges! I basted the Thinsulate to the lining before sewing the lining (also known as underlining), and then I trimmed the Thinsulate from the seam allowances as I sewed each seam of the lining in order to reduce the crazy amount of bulk that would have accumulated otherwise. Of course, when you have two layers of interfaced thick wool as well as a bulky layer of Thinsulate, a buttonhole is going to be an issue! My solution was to make a bound buttonhole, which worked out marvelously. I practiced a couple of times on scraps of fabric to be sure I was ready. And then there was the glass button that fell and broke. A bit of superglue solved that problem and it’s almost not noticeable. What was the best part? This coat is not for everyone, I know. But it’s just what I wanted. It has much more volume than my yellow coat, which is much lighter and less bulky. For real winter weather, however, I like the cozy, oversized look of this coat. It was a fun challenge to sew, and it’s always a confidence-booster to complete a time-consuming project like this one and realize that I was able to tackle every challenge with confidence. 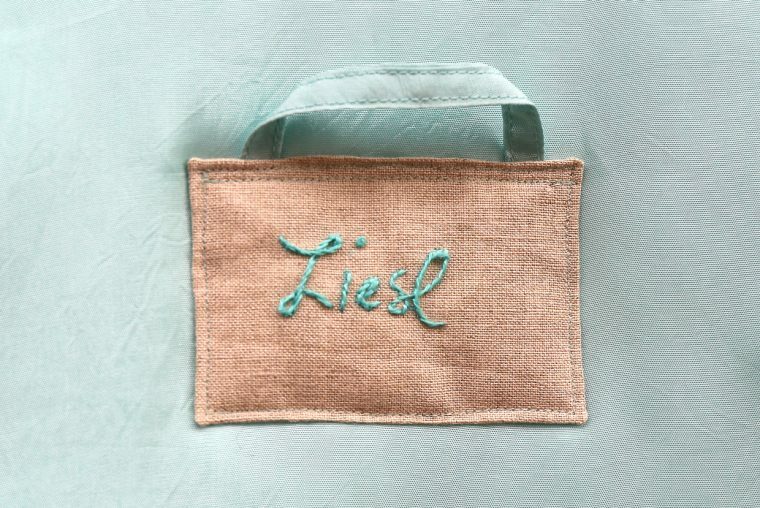 I took my time while sewing it (I even made a custom label and hanging loop for it) so I could be sure I was happy with each decision I made. I’m glad I took the challenge. Now I’m looking forward to wearing it! 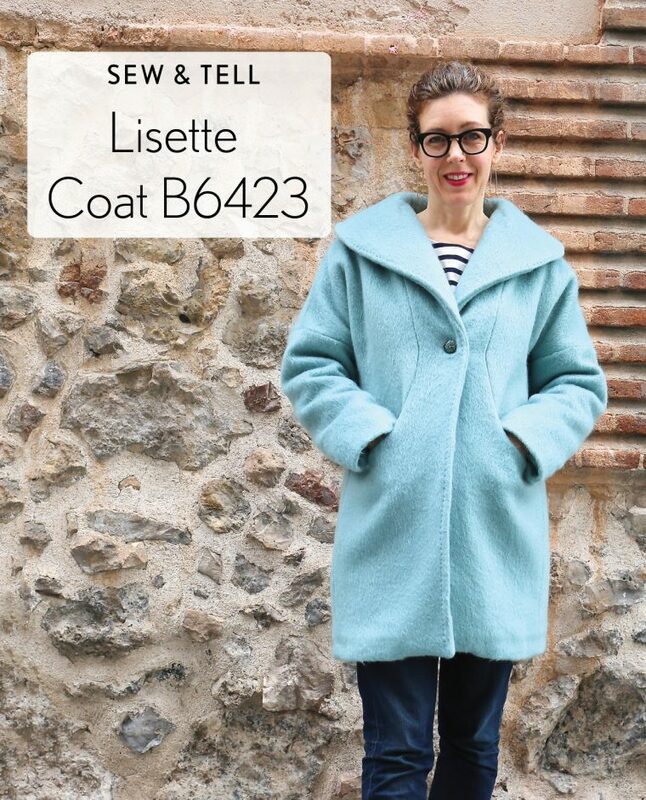 Between Butterick 6385 and Butterick 6423, which one would your recommend to someone as their first winter coat? Neither of them are particularly challenging, but this one probably has fewer steps. And the pockets are fun, of course! B6385 would be easier to adjust for fit, if that’s a concern. I love it! It looks so warm and cozy. The color is so beautiful too! You will surely enjoy this coat in cold weather. Thanks! It ALMOST makes me wish for more cold weather. Almost. It looks stunning on you! I love the color as well as the interesting seam placements. Thanks, Cindy! The seams make for easy pockets, that’s for sure. This is stunning! Love that it’s warm and the color is so lovely! Glad you could save your button!! Thanks, Emily! I was so sad when it broke. Your coat is wonderful & you look so cozy wearing it. Love the colour! I have just finished my version in a mustard yellow wool with a winter lining (satin on the right side & a warm cotton? On the wrong side). My button is the only unfinished element & buttonhole. I had considered making a bound buttonhole & was happy to see that you had success with yours. My machine makes fantastic buttonholes but like you, I am nervous about the bulk. I also have a bit of an issue with the collar laying as I want & had thought of using a pick stitch. Did you do that stitch on the upper or under collar? Through all layers? I think I may have a problem getting the needle through all of that bulk even though I tend to use a thimble. Hi Linda, it sounds like it’s going to be a great coat! I’m really happy with the bound buttonhole. Keep in mind that you finish the facing separately when you sew this type of buttonhole, so it’s really a good idea to sew it before you add the facing. (But it’s also not impossible to sew once the facing is sewn as long as the hem is still open. Thanks for your response Liesl. Not long after I posted my note to you I realized that I was too far along with my coat to work a bound buttonhole. The lining is completely attached now. It’s been many, many yrs since I last did a bound buttonhole (like 40yrs!) but I love them & they really are fun to make. Darn! I currently do not have a Facebook account but I am going to sign up right now since I just read in your post for today that you hope to have live videos in the future. Your blog is one of my daily reads & I am certain that your Facebook group will be fantastic also. Having a demo of the pick stitch would be wonderful & I am sure others would enjoy learning a new stitch also. When I want to try a new stitch I normally turn to my 1975 Vogue Sewing Book that I received from my Mom when I was 25yr old. I used it to see how to do a “catch stitch” to attach the coat facing to the bottom hem! Gorgeous! I would wear that coat with much pride! That coat is absolutely superb–it looks fabulous on you! Enjoy! Thank you! I can’t wait to wear it. So beautiful, and the colour really suits you. Those little details are so much fun, aren’t they? love the color of your coat! wonderful job! I’m interested in making track pants out a woven fabric and I saw your pattern in butterick and read you blog about the pattern. did you ever make your wool crepe track pants? It’s still on my (lengthy) list, Marilyn! I hope to do it sometime, and I’ll probably use wool flannel for it, not crepe. Will post when it gets done, that’s for sure! Really beautiful and so cozy looking. I am with you on posing for pictures, can feel a little awkward but I always love seeing a finished garment on an actual person so totally worth it in the sewing community. Thanks for inspiring with your gorgeous coat and wonderful patterns! Gorgeous!!! Beautiful shape and i just love that fresh colour!! Your coat is beautiful! I love, love, LOVE this color. <3 Where did you buy the Thinsulate? Adorable on you, looks warm and cozy, love the cheerful color. Great job. Have fun wearing it Liesl!!! Wow! It’s stunning I love it and and the colour is fab.